« Clinton Tax Returns Focus Email Controversy – a Y2k Moment? Disclosure: Parish & Company maintains no ties to any of the Presidential candidates. The purpose of this post is to summarize the major candidates tax returns and related financial disclosures. Given that both the Clinton and Bush campaigns have issued reports using the Scribd service, which prohibits printing the entire documents, as a public service, Parish & Company has created a simple archive at the end of this post with all the reports in a standard PDF format. Bush Background: Candidate Bush was born on February 11, 1953 in Midland, Texas. He is 62. He was sent to a boarding school in Massachusetts at the age of 14 and later graduated in Latin American affairs from the University of Texas. He married in 1974, became Catholic and has three children. His business career began in banking for Commerce Bank, whose Chairman of the Board was James Baker, former Treasury Secretary under Ronald Reagan. Commerce Bank ultimately merged into JP Morgan Chase. His experience at Commerce Bank included being posted to Venezuela for three years, prior to Hugo Chavez. Bush’s CPA is Gary Gerson of Miami Beach, Florida. Other than serving as Florida Governor from 1998-2007, he has mostly worked in banking. Bush Tax Return Summary: Jeb and Columba filed a joint return in 2013 and reported approx $7.3 million of income and federal income tax of $2.9 million. Their 2014 return has not yet been posted. Florida is one of seven states with no state income tax. The state tax reported of $40k was $25K from New York and the remainder from other states outside Florida. He filed one schedule C, for Jeb Bush and Associates, where he recognized $5.8 million in taxable income or 80 percent of the total reported income on his 1040 federal tax return. Capital gain and partnership income amounted to roughly $1.3 million or 18 percent of total income. The primary investment income source was Tenet Healthcare stock provided to Bush for his role as a board member. This gain upon sale was $556K or 43 percent of the total for 2013. Dividends and interest amounted to approx 2.5 percent of taxable income while charitable deductions were approx 1.4 percent of the same total. Total travel, meals and entertainment expenses for Bush and Associates was $132K. The only W-2 income reported was $27K, likely Bush’s wife Columba so they could maximize their family pension contributions to the Jeb Bush and Associates defined benefit pension plan, which lists two participants. These tax deductible contributions amounted to almost $350K per year over a 5 year period. See WSJ story on Bush’s Pension Plan Here (Pdf), which includes a copy of the annual 5500 filing. Bush Investment Summary: Basic banking is done at Suntrust Bank and the primary investment focus is energy and commodities. Returns are poor given the general decline in these markets of the last several years. 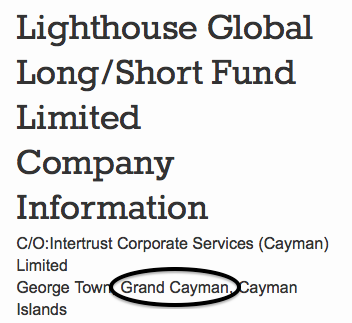 Like Romney, Bush has also invested heavily in private equity partnerships based in tax havens, one being the Lighthouse Global Long/Short fund, based in the Cayman Islands, with others being based in Hong Kong and the Marshall Islands. Clinton Background: Candidate Clinton was born in Chicago, Illinois on 10/26/47 into a Methodist family. Clinton is 67. She received an undergraduate degree from Wellesey in Political Science followed by a law degree from Yale, where she met Bill Clinton. In 1975 she moved to Arkansas, married Bill and became the first female partner of the Rose Law Firm. She later served on the boards of two Rose clients, Walmart and TCBY, from 1986 to 1992. After serving as first lady from 1992-2000 Clinton moved to New York and was elected to the US Senate in 2001, serving 8 years. She was later appointed US Secretary of State and served from 2009-2013. Clinton Tax Return Summary: The Clinton’s reported adjusted gross income of $27.9 million in 2014 and paid $9.9 million in federal tax in addition to state income tax of $2.8 million. The return includes 5 schedule C forms, one for each of their businesses. They are Hillary Clinton -Author, Hillary Clinton-Speeches, Bill Clinton – Author, Bill Clinton – Speeches and Bill Clinton – Consulting. Remarkably, the Clinton’s return shows no partnership, no dividend and no capital gain income. All their accounts are at JP Morgan Chase and appear to be short term low risk savings accounts throughout 2014. 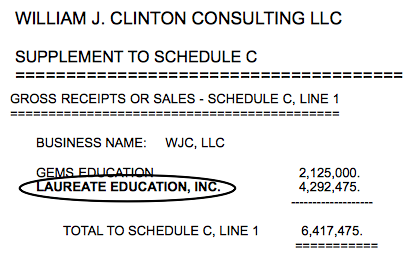 Also striking regarding the Clinton’s is that Bill has earned $21.9 million from 2010-2014 as a consultant to two for profit college enterprises, $16.4 million from Laureate Education and $5.5 million from Dubai based GEMS. Laureate was founded in Portland, Oregon in 1979 as Sylvan Learning Systems. In 2003 Sylvan sold its K-12 tutoring business to the private equity firm Apollo Management and kept the for-profit college segment, renaming it Laureate Education. With the cost of college and related student loan discussions now entering the campaign it is noteworthy how much for profit colleges have driven up the cost of education via excessive lending, in particular for graduate schools. One might ask, why are students encouraged to obtain law degrees via massive student loans when their are so few jobs in the legal community due to takeovers and related consolidation in so many industries? Many of these graduates now pursue careers in lobbying on behalf of private equity and hedge fund interests, undermining important regulatory safeguards. It is not known what percent of an education is financed at Laureate in comparison to public universities and other for profit colleges. For Clinton, dividends and interest together amount to less than .1 percent of taxable income while charitable deductions were approx 11 percent of the same total. Substantially all of the charitable contributions were to the Clinton foundation. Total travel, meals and entertainment expenses listed for 2014 were $375K and $1.1 million for Bill and Hillary respectively. The expense seems high for Hillary yet it is not clear how many employees travel with her. Total pension and profit sharing expense for the Clinton’s was only $2K in 2014. Neither Bill nor Hillary appear to have set up a defined benefit plan which would allow them each to set aside up to $350K each year and collectively reduce their taxable income by $700K. Also see related post regarding Clinton’s home office deductions and relation to email security controversy. Clinton Investment Summary: The Clinton’s liquidated a diverse portfolio of securities in their grantor trust on May 11, 2007 and later in 2008 exited private equity related investments, including a partnership with Ron Burkle of Yucaipa Partners. Since then they have invested in only low interest earning savings accounts until 2015. Recent disclosures indicate a large investment in the Vanguard Index 500 mutual fund. Clearly, it would not look good for a presidential candidate to have no investments in Corporate America. This must have been purchased in 2015 given the absence of dividend income in 2014 and lack of retirement accounts to hold such a purchase between $5 and $20 million, as disclosed. Both the William J Clinton and the Clinton Foundations primary purpose listed is fundraising. Clearly they are trying to make their philanthropy globally based yet domiciling these key fundraising entities in foreign nations not subject to US based disclosure requirements in order to enjoy tax exempt status. To her credit, Clinton has subsequently disclosed the donor identities to these offshore based charities. Overall, the Clinton’s foundations appear to be doing great work, and giving significantly more than the minimum required 5 percent each year to maintain tax exempt status is surprising. In addition, the Clinton’s have set up an outstanding defined contribution 401K plan for the foundation employees. I find this interesting because one would expect Donald Trump to have the superior plan yet the plan for Trump’s enterprises is low quality compared to the Clinton’s. As an advisor it continually amazes me how many successful business people aren’t willing to spend a few hours to have a great plan when the contributions are generally all from the employees, i.e. non company assets, and there is no additional cost between having a low quality plan, as Trump does, and the cost of a high quality plan similar to the Clinton foundations. Fiorina Background: Candidate Fiorina was born September 6, 1954 in Austin Texas. She is 60. Raised Episcopal she now considers herself a non-denominational Christian. She received an undergraduate degree in philosophy and history from Stanford and an MBA in marketing from the University of Maryland followed by an MS in management from MIT. Florina began her business career at AT&T in 1980 and advanced through its spinoff of Lucent Technologies to President. She later was appointed CEO of Hewlett Packard form 1999 -2004 and was the driving force behind the $25 billion acquisition of Compaq computer , which resulted in a financial disaster for Hewlett Packard. The acquisition was bitterly fought and one director, Walter Hewlett, spent $50 million of his own funds fighting the purchase. Fiorina was strategic in that she made her case for the merger directly to Institutional Shareholder Services (ISS), which voted the proxies for almost a third of all shares. Large funds rely on ISS opinion. Meanwhile, Hewlett naively went fund to fund trying to convince large fund managers to oppose the deal. At the time ISS was controlled by private equity interests, in particular Warburg Pincus, who rubber stamped most such proposals. See Smart Money Story Pdf Here. Ultimately, the Hewlett Packard board called for Fiorina’s resignation in 2005. A key criticism of Fiorina was her large entourage and lavish spending while at the same time eliminating tens of thousands of jobs, including drastic cuts in research and development. Carly and Frank Fiorina filed a joint return in 2013 and reported approx $1.9 million of income, federal income tax of $429K and state income tax of $121K. They list Lorton, Virginia as their residence for both 2013 and 2012, even though she did run for US Senate in 2010 in California and obtained more than 40 percent of the vote in the nations most populous state. Virginia’s state income tax is 5.75 percent while California’s is 13.3 percent. Dividends and interest amounted to approx $864K or 44 percent of their income. Charitable contributions of $261K amounted to 13 percent of income. Of this amount .5 percent was contributed in cash and the remainder in kind property. 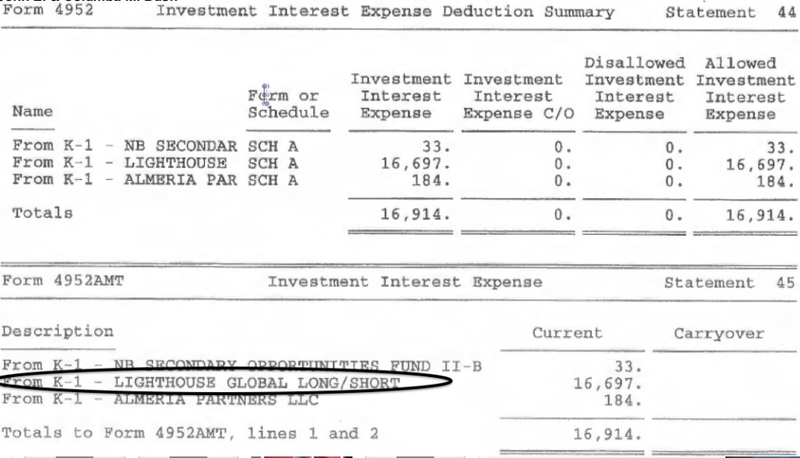 Florina Investment Summary: Fiorina maintains substantially all her accounts at Goldman Sachs and is invested in mostly private equity and hedge funds. 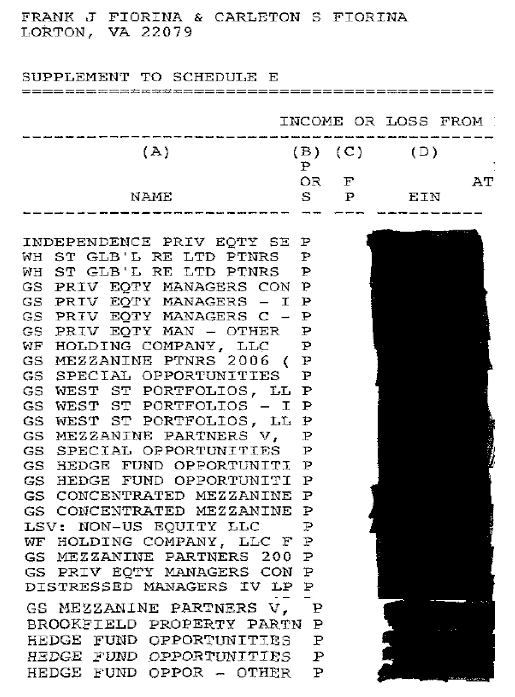 Her total income form this multi million dollar portfolio in 2013 for tax purposes was a loss of $209,300. Similarly her 2012 return showed a loss of $270,382. These losses resulted from valuable tax deductions being allocated to her as a partner, perhaps again highlighting why the tax rate on private equity investments should be secondary to the rules regarding how deductions are allocated, especially if deductions are coming from tax exempt investors who can not use them in the first place..